The inaugural champion in the Granite State Pro Stock Series, Bobby Cabral, has filed entry to the Monadnock 100, taking place May 24 at the Winchester, NH facility. Cabral won the first ever championship in the young series’ history in 2012 in dominating fashion. The Medford, MA driver took home a victory and three top 3 finishes out of 6 races, but more impressively, only finished outside the top 5 once (7th, Canaan). Cabral will be driving the #66c, with backing out of the LCM racing stables. Monadnock may be a great spot for Cabral to get back into the racing groove with the series. In two races there, both in 2012, Cabral picked up a pair of third place finishes. Cabral looks to continue that trend on Saturday. With Babb and Moltz picking up the first heat wins of the year, and 4th and 5th place finishes at Thompson Speedway Motorsports Park respectively, fans are sure to be treated to the hard, door-to-door battles for the remainder of the season. 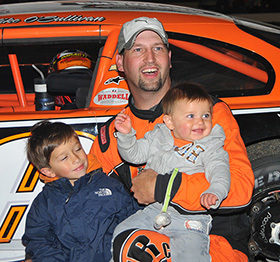 Opening race winner and 2013 champion Mike O’Sullivan has filed entry to the Monadnock Speedway event. O’Sullivan is expected to run a part-time schedule as he and wife Abby welcomed their third son, Cameron, into the family. O’Sullivan will look to take the checkers in consecutive races to begin the year. The Granite State Pro Stock Series welcomes Fran “JR” Colson and Dennis Maxfield back to action at Monadnock. The pair of veteran drivers are on the upside of medical issues, but will make their season debuts just days away. Also joining the list of pre-entered drivers are Mike Parks, Barry Gray, Greg Nanigian, Erik Sands, Matt Zenisky, Cory Roberts, Derek Griffith, and Ron Smith. The Granite State Pro Stock Series will run 100 laps at Monadnock Speedway on Saturday, May 24th. Post time is 6PM, and General Admission is just $20. Monadnock Speedway is located at 840 Keene Road in Winchester, NH. For more information on the Granite State Pro Stock Series, contact Mike Parks at mparks@gspss.net. Defending champion Mike O'Sullivan is expected to run a part-time schedule in 2014, but has filed an entry for Saturday's Monadnock 100.